NEAR THE RAINBOW’S END (1930, Tiffany) Bob Steele, Louise Lorraine, Al Ferguson, Lafe McKee. Bob finds himself in the middle of trouble between cattlemen and sheepherders. Behind it is a ruthless gang of rustlers. Some terrific fight scenes. Steele's first sound western. From a great 16mm print. MAN FROM HELL’S EDGES (1932) Bob Steele, Nancy Drexel, Julian Rivero. Bob busts out of prison and goes looking for a criminal mastermind and over $100,000 in loot. When he gets into town, he saves the sheriff from being shot. As a reward, the sheriff makes Bob a deputy! A number of neat plot twists follow in this good early Steele opus. Watch the 90-foot dive by Bob from the top of a damn! 16mm. HIDDEN VALLEY (1932, Monogram) Bob Steele, Gertrude Messinger, Francis McDonald. Bob and an old professor search for “Hidden Valley,” home of an ancient treasure and a lost tribe of skull-worshipping Indians. However, the professor is murdered and his map stolen. Bob’s arrested and convicted of the slaying. He makes a daring courtroom escape though, and tracks the killers--who have the map--right into Hidden Valley. The climax features--believe it or not--the Goodyear blimp! Which is prominently featured. A must-see. From 16mm. 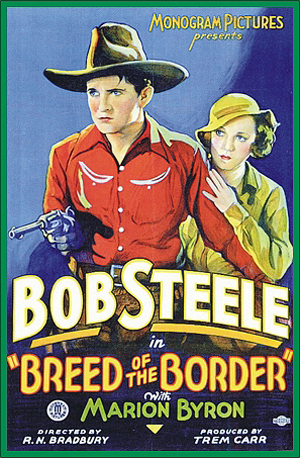 BREED OF THE BORDER (1933, Monogram) Bob Steele, Marion Byron, Gabby Hayes. An escaped killer hires a racer to drive him to Mexico. After they cross the border, the killer double-crosses him. Gabby teams up with Bob to hunt the villian down. Recommended. 16mm.